I like chicken and eat a lot of chicken breast. The reasons for this are that it is versatile to cook with and it’s an awesome source of dietary protein. 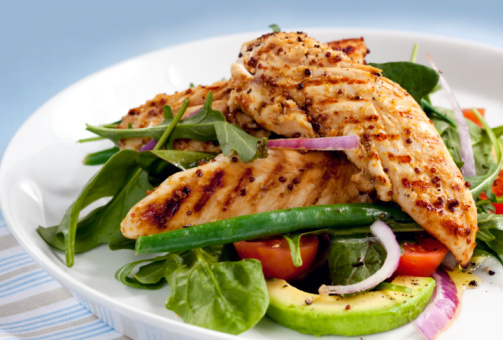 Chicken breast is also very low in fat and calories. My favorite is boneless, skinless chicken breast. It’s great baked and then cubed or sliced for a salad, or used in a sandwich wrap. Of course, I prefer to barbeque my chicken breast! Here is a really great recipe I enjoy making, because it’s fast, versatile, nutritious, and very tasty. Cook chicken in a skillet until browned and soft, then remove. Cook vegetables and garlic in the olive oil until soft, then remove. Mix the curry powder and the milk/cream together over low heat until smooth. Add the chicken and vegetables to the curry mixture, stirring until mixed. Serve with a salad over whole grain rice, or use as a filling for a sandwich roll-up. This is a great tasting recipe that I love. If you would like to add a Thai influence, try adding some red chili and 1/4 cup of coconut milk to the mixture.